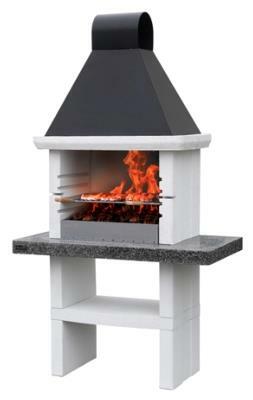 Natural coloured barbecue for self-assembly made of marble granulate with black metal hood and wide black worktop in high quality marble granulate with CRYSTAL polished marble finishing. The barbecue also has an integrated spit holder and comes complete with "Easy Fire" aluminium allow plate for easy fire lighting, fire bricks, adhesive and stainless steel grill, adjustable on four levels. Can be fired with charcoal and wood! Easy assembly with adhesive - no paint required. Safety Embers Stop Is Not Included.